It's been a solid month since I last wrote. Not because I haven't been doing anything, but rather I've been so busy I just haven't had the time to sit and write. It's going to take me a bit of time to catch up, but let's start with a run. 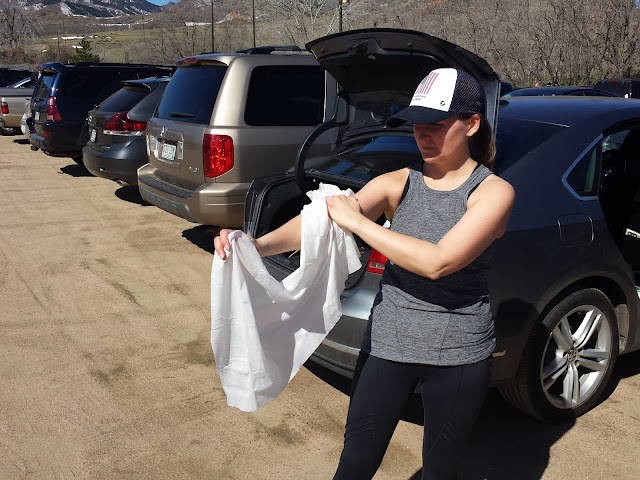 Several of my Oiselle teammates have been clocking a number of long runs prepping for Boston and other spring marathons, and I had noticed a number of conversations - and beautiful Insta shots - around Waterton Canyon. So a few weeks ago on a nice morning, Matt and I headed south about 30 minutes from our house in Denver to the canyon, just a bit past Chatfield State Park. Waterton Canyon, also known as Platte Canyon, runs along the Platte River which supplies a great amount the water from the mountains to the Denver-metro area. There's a rather large parking lot with an outhouse just past the entrance to the Lockheed Martin facility. After crossing the road you'll encounter the trail sign and a pretty nice - and what looks to be new - water fountain perfect for bottle filling. The path for runners and hikers is a wide dirt road that is pretty unassuming at the start. It's not until a few minutes into the run that you connect to the river and finally begin to see what all the fuss is about. While the road winds through the canyon along the river, and the mountain provides some shade, there are long stretches when the sun beats down. The temperature swing was pretty drastic between shade and sun - an aspect of Colorado weather you get used to pretty quickly. 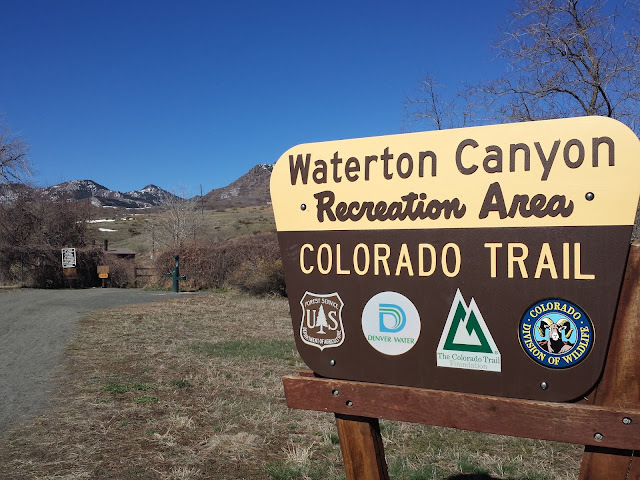 As many of my friends love to run and hike with their dogs, I'll mention now that mountain goats are common in this area so to protect the natural wildlife, dogs are not allowed in Waterton Canyon. 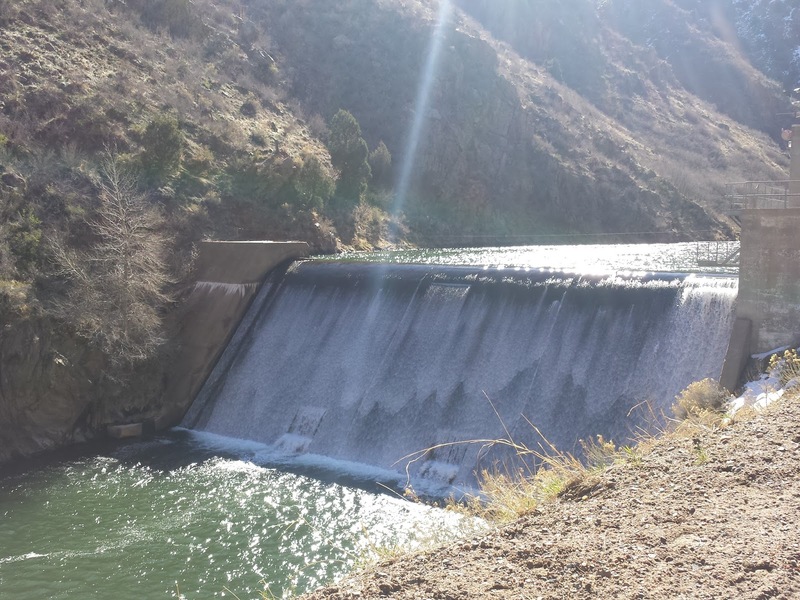 Mountain biking, foot traffic, and limited fishing in designated areas, are allowed. As usual, we started out on the early side as we'd rather not be on trails during the heat of the day. It was cool when we started and quite toasty when we finished. 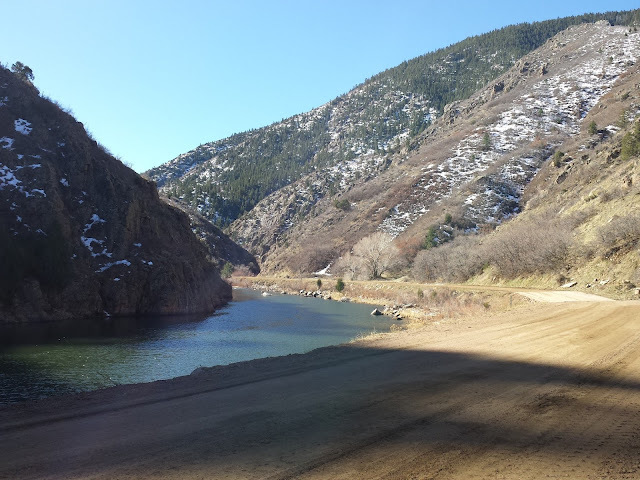 We ran a bit over 4 miles up the canyon to Mill Gulch Bridge where the trail/road switches to the other side of the river. 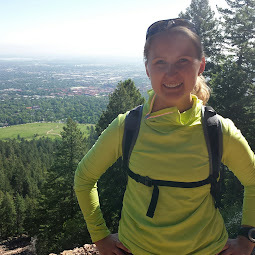 The trail starts at about 5550 feet elevation and climbs steadily into the mountains. I could definitely feel it in my legs and breathing, but the nice thing about running up a canyon is that once you turn around and head back, you're going down the whole way. It really was beautiful scenery and a different type of run than we're used to. The dirt road means that it's not technical but you get to enjoy a softer surface than running on a regular street, plus if you're doing a long run there's no thinking involved. Just head out and go. Well, keep an eye out for wildlife and mountain bikers, but you don't have to worry about traffic or keeping track of your route. Plus, this is the entrance to the Colorado Trail, which stretches 500 miles to Durango. By the time we got back to the car, we were pretty toasty and a good bit dusty. Since we wanted to stop for coffee and brunch on our way home, we needed to clean up a bit. 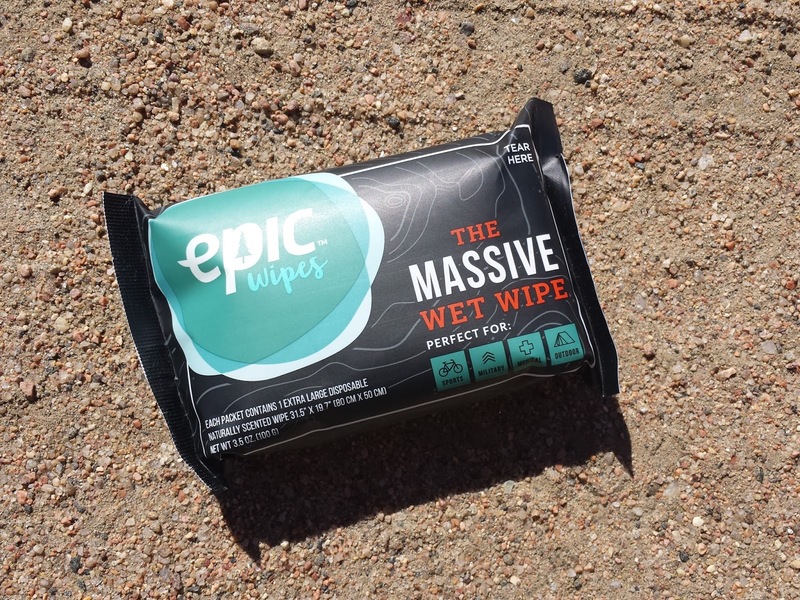 Thankfully, a few years back a cool new company, Epic Wipes, had reached out to me to try their product and I was psyched to try it out. At more than 2 feet long, Epic Wipes are the most massive and amazing wet wipes you will ever lay your hands on. They are like nothing you've tried. Created by a doctor who's been stationed in Afghanistan and has worked with patients at Walter Reed Medical Center, Aeneas Janze decided to create a product that could actually be useful to anyone without access to a shower and doesn't require 10+ small wipes to get clean (we've all been there at some point, right?). These genius wipes are made of bamboo and other biodegradable materials, they are free of parabens and utilize antibacterial oils including chamomile and eucalyptus. They feel cool on the skin even after hours sitting in a car trunk on a hot day. 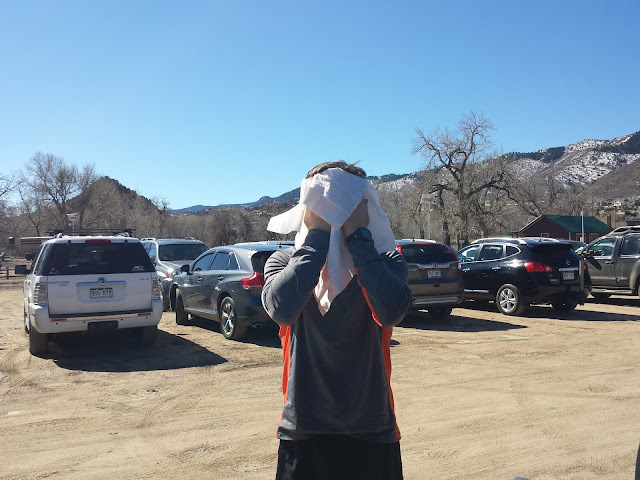 After our run up the canyon, Matt and I cleaned up with these wipes and they were perfect. I can't begin to explain how awesome they felt after that hot, dusty run. This product really could be useful for so many people beyond runners, the uses seem pretty limitless. Unfortunately for us, these aren't on the market quite yet. While packaging is done and there's a great product video, from what I understand, the company is getting ready to launch a Kick Starter campaign, which you can get updates about by signing up on the website. But, lucky for you, I have some to give away! I really just want to keep them all for myself, but two lucky people will win two Epic Wipes. Click HERE to Tweet about this giveaway (it'll open in another window) and leave a comment. Leave a comment on when you'd use Epic Wipes. Follow me on Instagram HERE and leave a comment to let me know. To win, you must live in the continental United States. You MUST leave a comment on this post for your entry to count. Two winners will be chosen randomly. Entries will be accepted until 5:00pm MT, Wednesday, May 26th. The wipes I tried, and the wipes for this giveaway have all been provided by Epic Wipes. The thoughts I've expressed about Epic Wipes are all my own.